"Noble Knight" monsters in the artwork of "Noble Knights of the Round Table". "Noble Knight", referred to as "Sacred Knight" in the anime and some video games, and known as "Holy Knight" (聖（せい）騎（き）士（し） Seikishi) in the OCG, is an archetype of LIGHT and DARK Warrior monsters. It was introduced in the Yu-Gi-Oh! 5D's Tag Force 5 Strategy Guide and received its first support in Return of the Duelist with "Noble Arms - Gallatin". 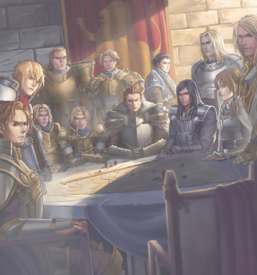 All "Noble Knights" (except "Noble Knight Joan") are based on the Knights of the Round Table of Arthurian legend, or on related concepts from Arthurian legend. The "Noble Arms" archetype supports this archetype, and encompasses weapons used by those knights. This archetype is related to the "Artorigus" and "Laundsallyn" archetypes. These two archetypes are only supported by "Avalon", which only supports members of those archetypes that are also "Noble Knight" monsters. "Noble Knight Artorigus" appears as a character in Yu-Gi-Oh! Duel Arena. In Italian, Portuguese and Spanish, the archetype names are respectively "Nobile Cavaliere", "Nobre Cavaleiro" and "Noble Caballero", with the adjective meaning "Noble" coming before the noun meaning "Knight". This is to make sure that the support cards work well with "Ignoble Knight" cards which are called "Ignobile Cavaliere", "Inobre Cavaleiro" and "Innoble Caballero"; however, in these languages the "Noble Arms" archetype has the adjective after the noun meaning "Arms". In French, the adjective is placed after the noun in both cases of "Noble Knight" ("Chevalier Noble") and "Noble Arms" ("Armes Nobles"), as "Ignoble Knight" cards are simply named "Chevalier Noble Infâme" (literally "Infamous Noble Knight"). There is no agreement on the noun phrase "Noble Knight" in English (the plural form is simply "Noble Knights", with no change reflected on the adjective "Noble"). However, in other languages there is, which makes the naming of the archetype potentially complicated. Plural forms are never used in French, German and Spanish card names, as shown on "Artorigus, King of the Noble Knights", "Noble Knight Brothers", "Last Chapter of the Noble Knights" and "Noble Knights of the Round Table". An ungrammatical plural form is used in Portuguese ("Nobre Cavaleiros"), without making the adjective "Nobre" agree, as shown on "Last Chapter of the Noble Knights" and "Noble Knights of the Round Table". In Italian, agreement is still applied on "Noble Knight Brothers", "Last Chapter of the Noble Knights" and "Noble Knights of the Round Table", with the plural form being "Nobili Cavalieri". This makes support confusing for a few "Noble Knight" support cards, such as "Noble Knight Brothers", "Ignoble Knight of High Laundsallyn" and "Artorigus, King of the Noble Knights". The archetype relies on equipping the "Noble Knights" with the "Noble Arms" Spell Cards and take advantage of this, either by searching for more support or simply destroying cards. There are also some "Noble Knights" that behave like Gemini monsters, being treated as Normal monsters while they are not equipped with a "Noble Arms" card. Once equipped, they gain an effect, and with the exception of "Gwalchavad", all of them become DARK and increase their Level by 1, in order to assist the Xyz Summon of "Sacred Noble Knight of King Artorigus" or the effect of "Lady of the Lake" to Synchro Summon "Ignoble Knight of High Laundsallyn". The "pure" Level 5 "Noble Knights" can be Special Summoned from the hand and/or Graveyard and also serve to speed up the aforementioned Xyz/Synchro Summons. The aforementioned "Noble Arms" are Equip Spell Cards in the shape of swords with a broad variety of effects, that range from offensive effects like destroying cards or giving ATK boost to support/defensive effects like protecting against destruction and targeting effects. With the exception of "Excaliburn", all of them can re-equip to a "Noble Knight" you control when they are destroyed and sent to the Graveyard, so that even if you Special Summon a Extra Deck "Noble Knight", by using materials that were equipped with "Noble Arms", those Spell Cards will re-equip themselves to that new monster. The following Decklists may or may not contain copies of cards that exceed the maximum amount allowed by the current Forbidden & Limited List. These should not be changed, as these Decklists are copied verbatim at the time they were published. This page was last edited on 28 February 2019, at 04:35.